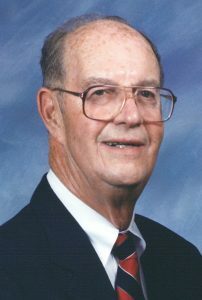 William W. “Bill” Henderson, Jr.
Lansing, Michigan, passed away on April 2, 2019 at Masonic Pathways in Alma, Michigan. He was 91-years old, born on May 19, 1927 to Margaret (Nungester) and William W. Henderson in Ann Arbor, Michigan. Bill lived many places, including Chicago, Il; Lima, OH, and Lubbock, Texas, but was primarily a resident of Bloomfield Hills, Michigan where he owned a home and lived more than 40 years. A proud 1951 graduate of the University of Michigan, Bill worked for many years at Aircraft Precision Products, Inc. He was president from 1979 to 2001 and served on the board of directors after retiring in 2001. Bill was the father of sons William III (Candy) and Gary (Beverlee). He is grandfather of Ashley (David) Laylock, Trace and Marian Henderson and Craig (Kristin) and Marc (Barbara) Coughlin. Also, great-grandfather to Cole, Grant, Beau, Logan and Lauren Coughlin. Bill was preceded in death by his sister Anne Harper and her husband David. He is also survived by nephew Jeff Harper (Kimberly) and niece Julie Fizer as well as Katie and Grant Harper and Anthony and Jennifer Fizer. A veteran of the Merchant Marines and the United States Army, Bill served our nation during the Korean War. He was a member, and usher, at Kirk in the Hills Presbyterian Church in Bloomfield Hills and a member of the Bloomfield Open Hunt Club. Bill enjoyed playing tennis, reading about history – particularly World War II – and traveling. A funeral service will be held on Saturday, April 13 at 11 a.m. at Estes-Leadley Greater Lansing Chapel, 325 West Washtenaw Street, Lansing, Michigan. Visitation will be from 10-11 a.m., also at Estes-Leadley Funeral Home. Private family Burial will be at Delta Center Cemetery, Lansing, Michigan. Sorry to hear about your loss . Our prayers go out to the entire Henderson family during this time of tremendous loss with the passing of Bill Jr. May God bring you peace and understanding.